The Buenavista Family Inn is configured and outfitted to support Conferences, Meetings and/or Seminars. The Dining area supports the use of the latest in visual aids, movie projectors, surround sound systems, computer aided graphics coupled with a television monitor, and/or Internet usage. Our electric receptacles run standard 220 VAC. The use of three-pronged properly grounded receptacles is standard. The dining area has a long wall along which a projection screen, or portable chalkboard, flip-chart easels or diorama ensembles may be installed or assembled. Additionally we also have portable platforms upon which slide projectors, or overhead projectors may be securely placed. 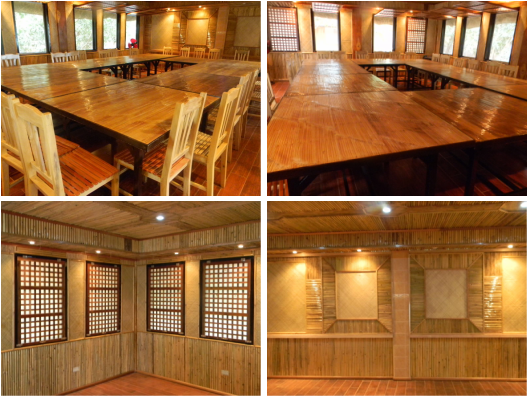 The Dining area is furnished with tables and chairs for your seating comfort during conferences, meetings and seminars. The efficacy of your seminar, meeting, or conference is foremost on our minds. For this reason we will go the extra mile to make sure your sessions are free of "outside-disturbances" and undistracted with interruptions.